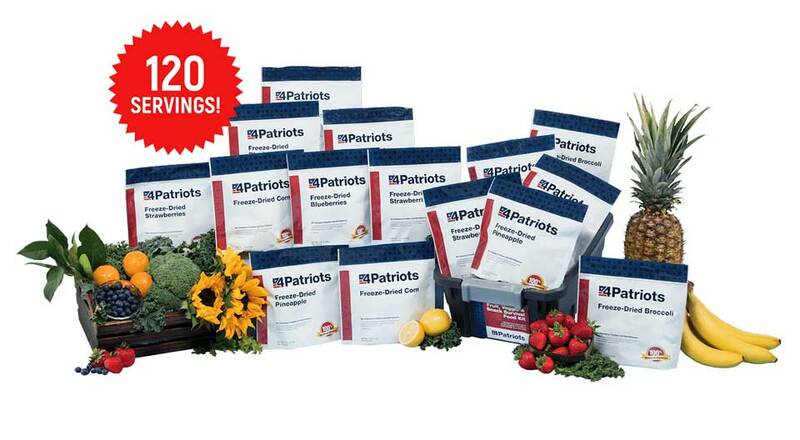 “Supercharge” your survival food stockpile and get all the plant based nutrition you need with Food4Patriots Fruit, Veggie and Snack Mix – wholesome, delicious, and good for 25 Years! Packaged in convenient and lightweight mylar pouches, our emergency survival food seals in the flavor and retains a high-nutritional value. I have always love dried fruit and vegetables, but I was not impressed with any of these products. Not sure how the servings are measured out, but did not feel like it was 8-10 per package. I may still try your creamy stroganoff. Too expensive to eat as snacks... I bought it in case of an emergency, I'm saving it for an emergency. I'm trusting it to work out. At some point I'll tap into it when necessary, but not until then. My concern is I am on a low sodium diet. I purchased the 3 month supply as well as the fruit and nuts. I haven't tried any of them yet. I would like to see more low sodium items and would purchase more. Thanks . PURCHASE WAS FINE. HAVEN'T TRIED THEM YET. I liked the strawberries, blueberries, pineapple and banana chips and would like to have seen more of these than green beans and corn. I would also be nice to be able to order all items ala carte because some are liked more than others. Just personal taste. The banana chips and the strawberries were the only ones so far that my family have tasted. I personally like them both. I eat them alone and in cereals. Don't know what else to say, but that I think I had never eating dehydrated food before. Maybe I have.? They are OK! I need to try the 72 hr. emergency food to see what it's like. The packaging is good. My only complaint is that the bags are family sized, so for a single person, I will be eating all 8 servings of pineapple by myself once I open the bag and throw away the oxygen absorber. It does not say how long you have before it needs to be consumed once opened, but it does have a zip lock built in, so maybe I would have a few days to eat it? It is for this reason that I have not tried any of the selection that came in the sturdy plastic storage bin. I cannot honestly tell you about the taste or quality of the FRUIT/VEGGIE/SNACK MIX. My purchases thru Food4Patriots are for emergency storage. I don't use them in the interim. They are saved solely in case of emergency. I figure I have about 25 years of life left in me, and that is the storage capability of your products. So all is well! I simply stored the product away after being surprised on how little the containers weighed. I didn't try out the product, as I bought it for a rain day as with the other products. Not crazy about the selections, but know that variety & vitamins are important. Hey Frank, i haven't tried any of the fruit packs, i was saving them for an emergency, however, i would like to have received 8 more servings of blueberries and 8 more servings of the pineapples and 8 less of corn and 8 less green beans, they are not my favorites, and maybe left out the chocolate pudding and added more fruits instead and i would have been good with just fruits. The food was pretty good. I did not care for the strawberries but enjoyed the blueberries. I have eaten the green beans and they were good. The storage container is easy to move, open and secure. There is much too much Broccoli and green beans. I don't consider them snacks. Maybe 8 servings of each at the most. Not enough blueberries or pineapple. Everything I have purchased from 4Patriots arrives in sealed containers which must remain in that state to ensure their longevity. So how can I review what I have not yet consumed? Went straight to storage. Hope i never have to taste it. It's good! Leave out the corn, add potatoes and much, much more Banana Chips. The chips were gone in an hour just between two people. The servings per package could be smaller in all cases. The fruit is great as is, for a snack... the veg I will save for a rainy day. I would prefer to be able to buy just the fruit... I don't really like the veg mixed much. This is a very good product, as the title says, for what it is. As with many survival foods, the emphasis is on number of servings, rather than calory content per serving. Frank makes it VERY clear that this is comfort food, designed to supplement a more basic survival ration, and not necessarily a "front-line" food. As long as these facts are kept in mind, these products are an excellent investment. I have purchased a great variety of items from the 4Patriots group, including this one, and I have been very well pleased with the quality of the product. I fully intend to continue doing business with Frank and Co.